Daniel Lugo (Mark Wahlberg), Paul Doyle (Dwayne Johnson) and Adrian Doorbal (Anthony Mackie) - collectively known as the Sun Gym Gang - have big dreams. Body builders who have worked out until near physical perfection, they now want their bank accounts to start reflecting the same statute. The Gang has had various run ins with the law, and Daniel, who works a day job as a trainer at the Sun Gym, is no stranger to running confidence scams. Buying into the legal scams of "get-rich-quick" huckster Johnny Wu (Ken Jeong), Daniel comes up with the plan to kidnap and extort Victor Kershaw (Tony Shalhoub), a wealthy and cantankerous patron of the Sun Gym. The Gang certainly has the muscle to pull of the job, but they also happen to be the dumbest criminals south of the Mason-Dixon line. They botch kidnapping, one detail at a time, until their scam catches the eye of a private investigator (Ed Harris). The PI sets out to determine the validity of of the Sun Gym Gang's more outrageous exploits. 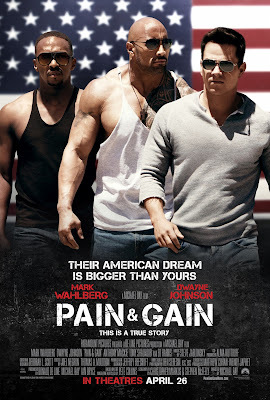 Pain & Gain is based on a series of articles by Pete Collins, which recount the true story of the Sun Gym Gang. After a particularly outrageous series of events, a title card pops up to inform the audience that, yes indeed, this is still a true story. Unfortunately, Pain & Gain meanders a fair amount, and its two hour run time likely feels longer thanks to the many flashbacks and side stories represented. After the main kidnapping scene the film continues for an hour, in order to show the consequences of the Sun Gym Gang's actions. In any other film, the Sun Gym Gang would have been portrayed as the villains, but here they are shown to have a warped, if sincere, belief that they are legitimately pursuing the American Dream. Their deeds don't appear to be motivated out of malice, but rather ignorance, idealism and substance abuse. The actors portray the characters with an inherit likability, which often juxtaposes harshly with some of their violent activities. The film's mish-mash of dark comedy, action and true crime biography could have been blended better. At times, the Gang seems like they could be a 2013 version of a Three Stooges short, if the Stooges delved into such the comedy goldmines as homophobia, body dismemberment and getting totally Alpha. Despite its paeans to the American Dream, the film's most overt message, if there can be said to be one, is a fairly standard issue "crime doesn't pay." If the film was intended to be a satirical look at America's obsession with wealth it slightly misses the mark by trying to have it both ways. The frat boy leads are in turns portrayed to be both ludicrous and earnest. Pain & Gain has been jokingly referred to as director Michael Bay's "art film," and that may be true. Seemingly cribbing from Terrance Malick, not only does the film feature narration from the Gym Sun Gang, but also other characters as well. The film is stylishly neon colored and uses Bay's trademark kinetic camera. Pain & Gain was written by Christopher Markus and Stephen McFeely, and also features appearances by Rebel Wilson and Rob Corddry. 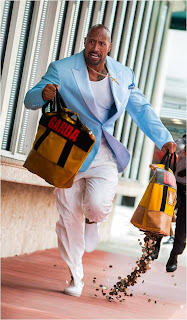 Pain & Gain is an always watchable film, that suffers from a meandering pacing and unclear intentions. Is the audience supposed to like the Sun Gym Gang or are they monsters? Is the American Dream a sham or are the leads merely too incompetent to achieve it? Pain & Gain is a morally challenging, outrageous and entertaining action biography. If only it had done a few more reps to push it into greatness.